Video surveillance is happen to be a massive growth area worldwide, video surveillance is a critical technology as the data is simply too valuable and sensitive to be lost. The widespread adoption of closed circuit television cameras has accelerated its convergence with the IT industry, and heralded in a period of robust expansion and is accountable to cause a escalation in demand for enterprise storage solutions, particularly for the storage-intensive verticals of Government, City Surveillance, and Transportation. Goldstein Research analyst forecast the surveillance storage device market size is set to reach USD 27.5 billion by 2024, at a CAGR of 14.1% over the forecast years. 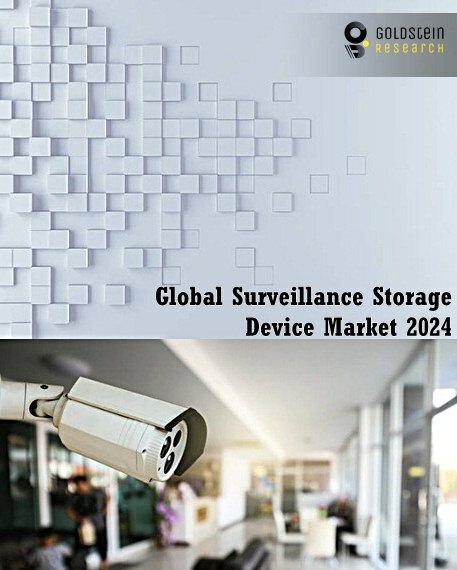 The report covers the present ground scenario and the future growth prospects of the surveillance storage device market for 2016-2024 along with the number of installed base in various verticals specific to regions, shipment of network cameras & HD CCTV cameras globally and adoption rate in residential and commercial usage. We calculated the market size and revenue share on the basis of revenue generated from the sales of surveillance storage device from major players across the globe. On the basis of storage technology, the Network Attached Storage (NAS) technology recorded highest revenue share of 42.25% in 2016 while direct attached storage and unified storage tends to boost the market in upcoming years. Surveillance Storage Device Market Outlook 2016-2024, has been prepared based on an in-depth market analysis from industry experts. The report covers the competitive landscape and current position of major players in the global surveillance storage device market. The report also includes porter’s five force model, SWOT analysis, company profiling, business strategies of market players and their business models. Global market report also recognizes value chain analysis to understand the cost differentiation to provide competitive advantage to the existing and new entry players. Our global surveillance storage device market report comprises of the following companies as the key players in the surveillance storage device market: Huawei Technologies Co., Seagate Technology LLC, Rasilient, Veracity, Western Digital Corporation Coraid, HGST Inc, Hitachi, March Networks, Pelco (Schneider Electric), Pivot3. According to the report, major driving factor for expansion of surveillance storage device market is high definition, megapixel network cameras which result in decrease in price and begun to proliferate, the need for reliable and scalable storage space has risen. Further, the report states that the major challenge which is being faced by the companies is to educate the customers about the advantages of implementing a proper recording solution. Most of the customers are unaware about the solutions available and which solution is best fit for their requirement. Based on geography, Asia Pacific holds the largest market share of 35% in 2016 while Middle East & Africa and Latin America is projected to witness a robust growth with a CAGR of 14.45% over the forecast years. Saudi Arabia and Kuwait hold the opportunities for the surveillance storage device player owing to expansion and construction of new hotels, shopping malls and public infrastructures. What is the shipment of surveillance storage device in 2015-16 and what would be the expected demand over the forecast period? We provide two-hour complimentary interaction with our analyst after the purchase of this market report. Details are imparted within the report.